[There has been an] extraordinary shift in how we understand and treat psychosis, none more so than in the arena of Early Intervention (EI) bringing with it new hope for young people with emerging psychosis and their families. Centred around the Early Psychosis Declaration (EPD), this book explores the declaration's five themes through contributions from a sizeable number of mental health practitioners, service-users and carers. It is designed to help those working with people experiencing psychosis at an early stage of illness to develop and implement effective early intervention skills, enabling them to examine and refine their practice. Most importantly, the book is a practical guide to delivering early intervention strategies with a unique focus on recovery. Paul French is Associate Director for Early Intervention in Greater Manchester West Mental Health NHS foundation Trust and Honorary Senior Lecturer in the Department of Psychology, School of Psychological Sciences, University of Manchester. Jo Smith is Joint National Early Intervention Programme Lead for NMHDU (National Mental Health Development Unit) and a Chartered Clinical Psychologist. She is also Early Intervention Clinical Development Lead for Worcestershire Early Intervention Service with Worcestershire Mental Health Partnership NHS Trust. David Shiers is Joint National Early Intervention Programme Lead for NMHDU (National Mental Health Development Unit) and GP advisor for the West Midlands. Mandy Reed is a Consultant Nurse for Early Intervention in Psychosis and a Senior Lecturer at the University of the West of England (UWE). Mark Rayne is a Programme Specialist in Service Development for the NHS West Midlands Regional Development Centre. 1. Introduction (David Shiers and Jo Smith). Theme 1 Improve access and engagement. 2. Duration of untreated psychosis and pathways to care (Kat Brunet and Max Birchwood). 3. Inpatient provision in early psychosis (Tom Craig and Paddy Power). 4. Developing youth focussed services (Kathryn Pugh and Clare Lamb). 5. Strategies for engagement (Lynda Tait, Diane Ryles and Alexa Sidwell). 6. Early intervention service models (Guy Dodgson and Stephen McGowan). 7. Cognitive behavioural interventions in early intervention services (Elizabeth Newton and Emma Cotes). 8. Culturally diversity in early psychosis (Swaran P. Singh and Satnam Singh Kunar). 9. Antipsychotic medicines and their use in first episode psychosis (Alan Farmer). Theme 2 Raising community awareness. 10. Working with diagnostic uncertainty in first episode psychosis (Alan Farmer). 11. Early detection and treatment opportunities for people with emerging psychosis (Paul French). 12. Primary care liaison for individuals with first episode psychosis (David Shiers and Helen Lester). 13. Raising community awareness for early psychosis (Kate Macdonald and Paul Blackburn). 14. Raising awareness in schools (Rowena Passy, Carly Mays, Graham Carr, Glenn Roberts, John Somers and Jos Dawe). Theme 3 Promoting recovery and ordinary lives. 15. Working with motivational difficulties in first episode psychosis (I. Reid, T. Barker and J. Smith). 16. Early intervention and vocational opportunities (Eric Davis, Richard Burden and Ros). 17. Substance misuse in first episode psychosis (Ian Wilson). 18. Relapse prevention in early psychosis (A. Gumley and C. Park). 19. Trauma and first episode psychosis (M. Bernard, C. Jackson and P. Patterson). 20. Suicide prevention in early psychosis (Paddy Power). 21. 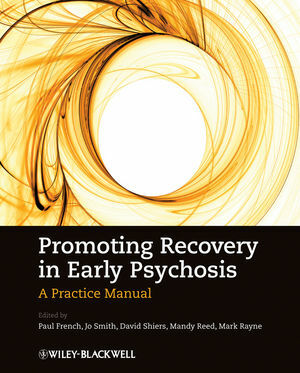 Managing delayed recovery in first episode psychosis (Charles Montgomery and Glenn Roberts). 22. Nurturing hope in early psychosis: A conceptual model to guide intervention (Dan Pearson). Theme 4 Family engagement and support. 23. Family interventions for first episode psychosis (Frank R. Burbach, Grainne Fadden and Jo Smith). 24. Sharing care with families (Mandy Reed, Sharon Peters and Lizzie Banks). 25. The needs of siblings in first episode psychosis (Jo Smith, Gráinne Fadden and Lucie Taylor). 26. Group based interventions (David Glentworth and Mandy Reed). 27. Roles of different professionals (Iain Wright). 28. Shared capabilities in mental health practice (Gina Smith and Sarah J Boldison). 29. Training clinicians working in early intervention (Eric Davis, Mark Rayne, Ian Wilson and Lindsay Rigby). 30. Clinical supervision in early intervention teams (T. Gillam). 31. Conclusion: Where next for early intervention. Suitable for qualified practitioners from all disciplines working in the Early Intervention field, including mental health nurses, psychiatrists, social workers, occupational therapists, clinical psychologists and lecturer/practitioners.